Intrepid Control Systems » Data Loggers Data Loggers | Intrepid Control Systems, Inc. 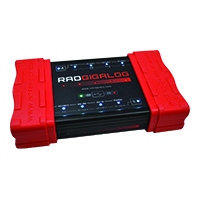 Please browse our data loggers below. Click on a specific tool to learn more. Intrepid's new solution for the high volume of data produced by modern vehicle applications. Features high-speed 10G and 1000/100/10 Ethernet interfaces and the ability to log 6 TB+ of Automotive Ethernet, CAN / CAN FD, FlexRay and other messages.